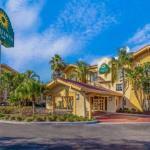 The central location free Wi-Fi free continental breakfast heated outdoor pool and spacious rooms with flat-panel TVs add up to an attractive deal for our guests at La Quinta Inn Tampa Bay Pinellas Park Clearwater. In the 115 rooms at this three-story La Quinta Inn guests will find free Wi-Fi flat-panel TV with HD channels a coffeemaker and an iron with ironing board; non-smoking rooms are available. Complimentary newspapers and continental breakfast are also provided for a morning pick-me-up. The heated outdoor pool helps vacationers relax and the meeting facilities bring business travelers together. Laundry machines are available. Pets are allowed and parking is free. This inn is just off Highway 19 with easy access to I-275. Guests can take in a Tampa Ray Rays game at Tropicana Field seven miles away or enjoy the many beautiful Gulf beaches nine miles distant. For dining a family restaurant is in the parking lot and several chain restaurants are within a mile. Tampa International Airport is 15 miles away. Dogs of all sizes are allowed. There are no additional pet fees. Dogs must be leashed and cleaned up after. Dogs must be healthy; tick and flea free, and be removed for housekeeping.